Welcome to The Oaken Bookcase stop on the Socialpunk Blog Tour! You can find links to the other blogs taking part on the socialpunktrilogy.com site, but make sure you enter the giveaway below my review first! I really enjoyed reading this book – the action just keeps on rolling and I found it very difficult to stop reading! At first, Socialpunk looks a lot like another YA dystopia I read recently, Divergent. Like Divergent, Socialpunk is set in a future Chicago, cut off from the rest of the world. There’s some jumping on trains and joining of social groups, here called a “hash” rather than a faction, but that’s really where the similarities ended. Socialpunk is filled with interesting future tech – cybernetics, creative art directly from thoughts and food in pill form, to name but a few things. It’s a fascinating society as well, although we don’t get to hear as much about how it all works as I would have liked. What are the hashes for? Perhaps we’ll find out in the future books. The story is action-packed and very compelling. I found the love polygon a little overdone for my tastes – it seems everyone is in love with someone else, but the relationships are all very sweet. Ima herself is a strong and determined girl with a past that makes her vulnerable. I do think that I’d put up a bit more of a fight if someone was trying to implant cybernetics in me, though! 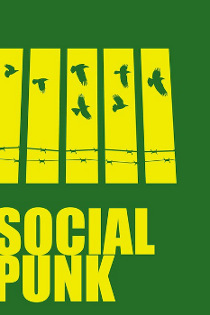 Fans of high-tech dystopian stories will love Socialpunk. I know I’m looking forward to the next instalment, Socialmob, due for release in July 2012. Monica Leonelle is holding a tour-wide giveaway to promote the launch of the Socialpunk Trilogy, open Internationally! What did others think of Socialpunk?